Here are my questions: 1- Should I include the parameter h only for the weighted carbons since the numbering of the molecule I am studying includes only carbon? 2- If 1 is no, how should I include the k parameters described before hand? Any other suggestions to find VAM is appreciated. 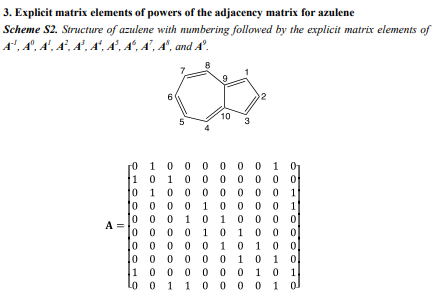 As a comment: The matrix-representation you search emerges from graph theory, and mathematics. 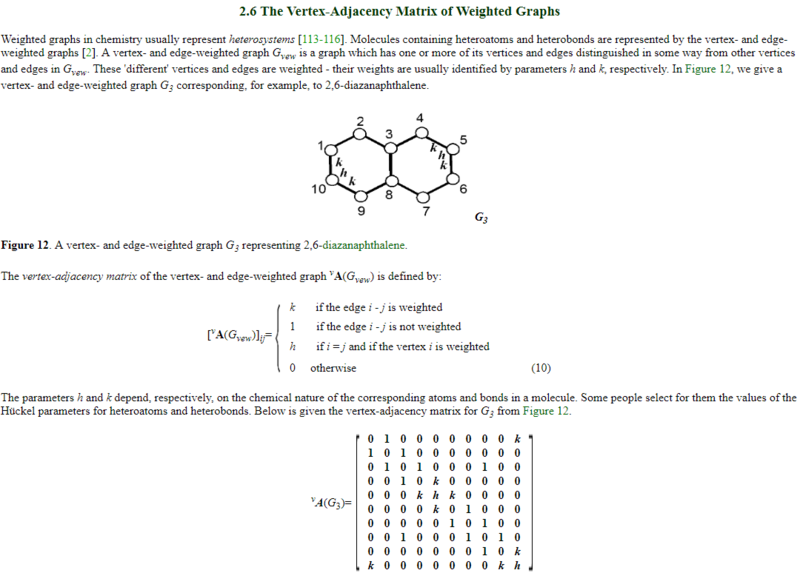 The numbers drawn in the structures earlier (1 for the carbonyl carbon, 2 to the carbon adjacent to the -SH group) a synthetic chemist refers to (e.g., "let us introduce an alkyl chain in the 4-position") do not (necessarily) relate to the numbers to denote the vertices in these nets. These are seasoned descriptions are still reviewed (2nd edition), and apparently the Open Molecular Generator were one tool to generate them. Not the answer you're looking for? Browse other questions tagged organic-chemistry physical-chemistry computational-chemistry density-functional-theory or ask your own question. Why is Density Functional Theory notoriously bad at describing oxygen molecules? Why is Hessian Matrix called 'force-constant' matrix?